The Maersk Line Triple-E is the largest container ship in the world. It’s a monster. Seeing images of this vessel really does not do it justice. 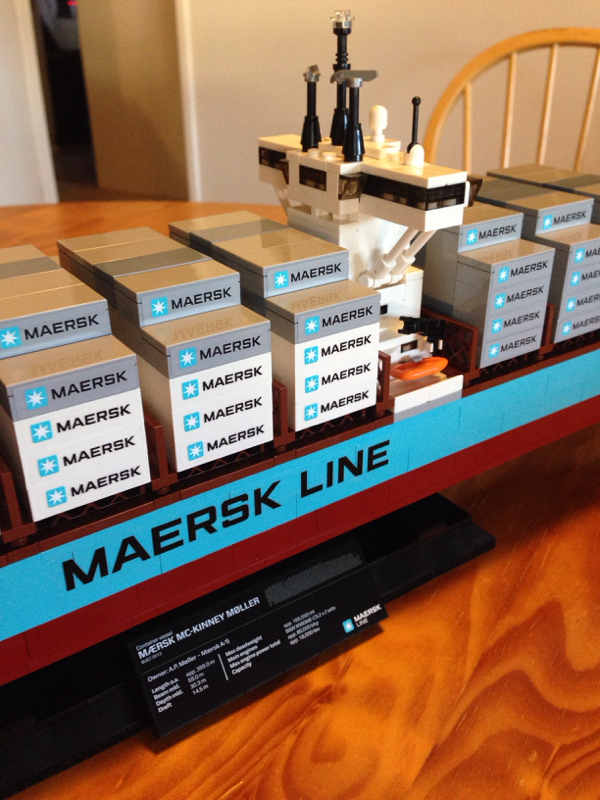 LEGO and Maersk have been good friends for a while now. 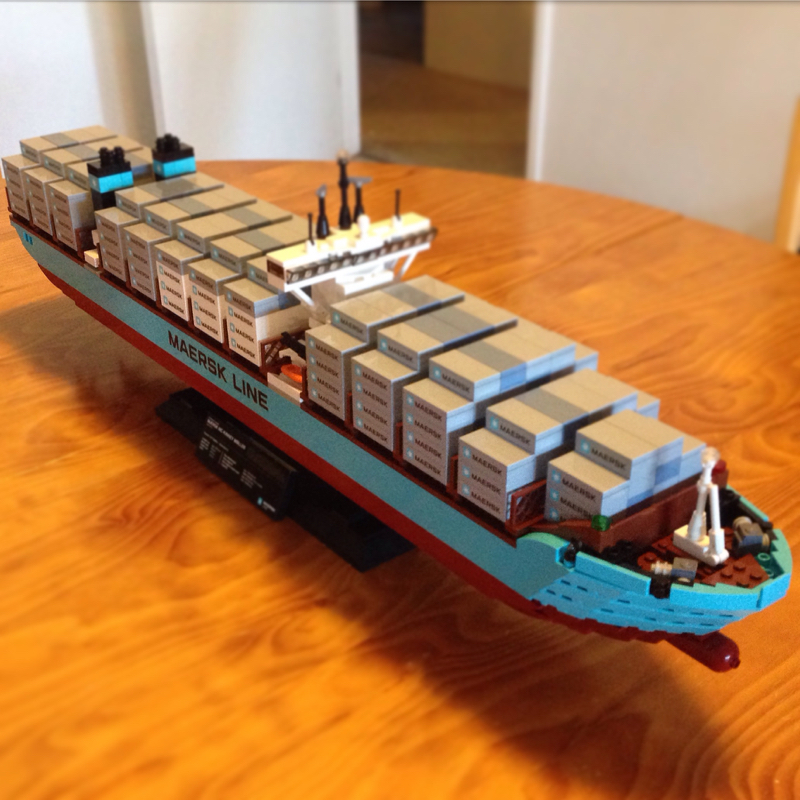 All the way back in 1974, LEGO released the first Maersk set – a container ship. 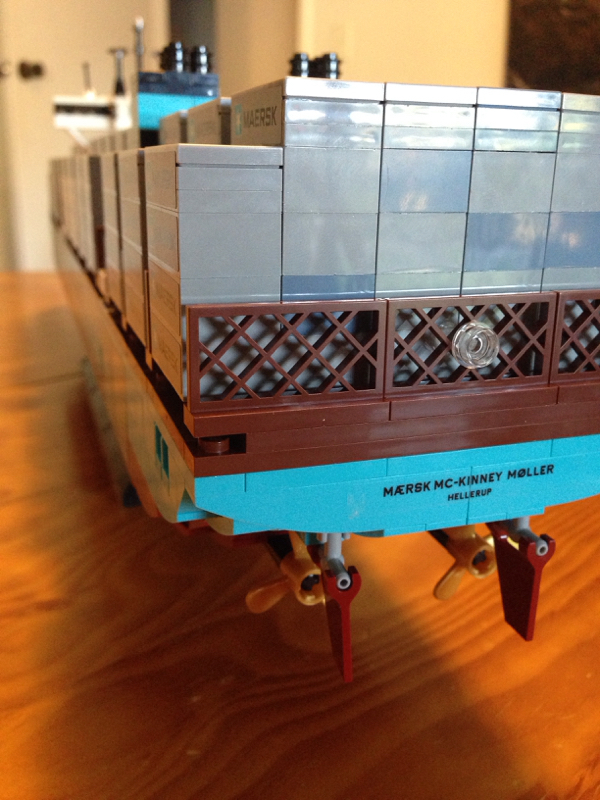 It was a little one, with only 220 pieces, but it was the first of a very popular line of sets. 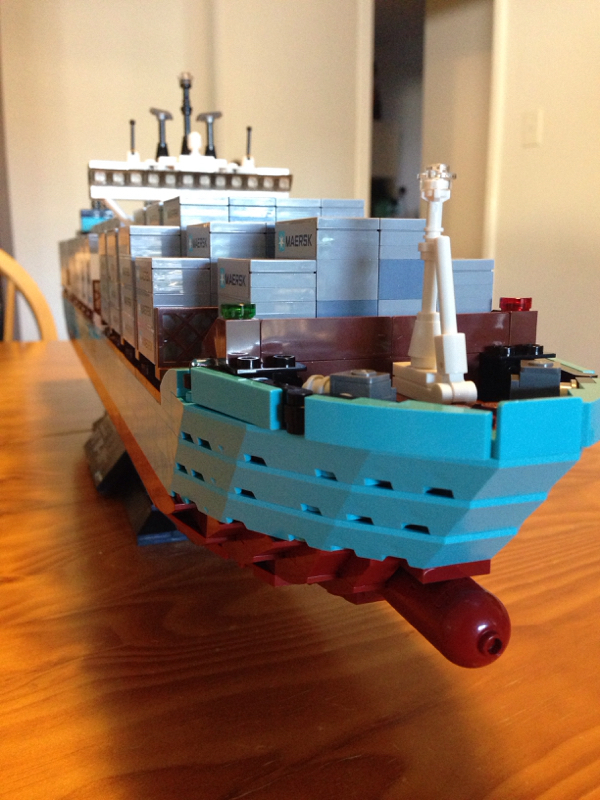 Since then, we’ve had another 7 sets grace the LEGO shelves, including 3 more container ships, 3 trucks and trailers, and the very highly sought after Maersk Train. 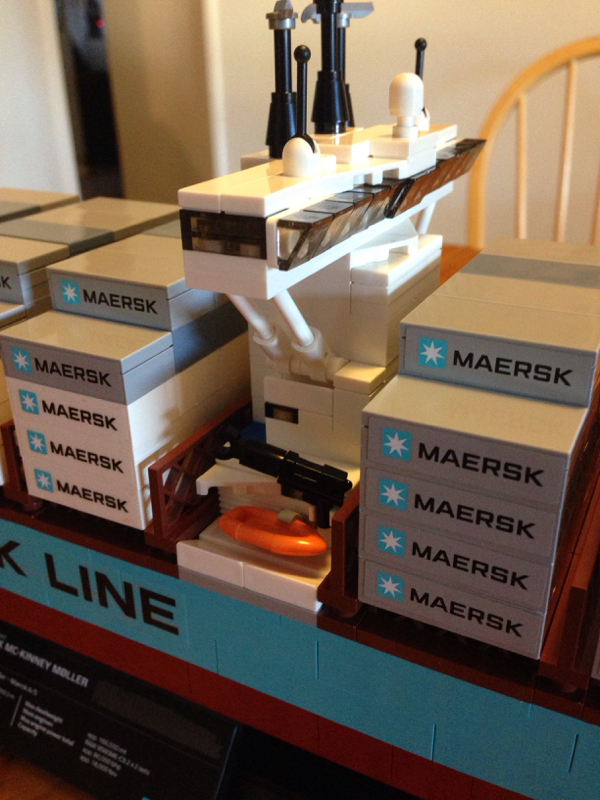 This one is definitely the cream of the Maersk crop. Inside the box sits 15 bags of parts, 2 instruction booklets, and a whole lot of stickers – 115 in fact! There are plenty of parts to get excited about with this build. 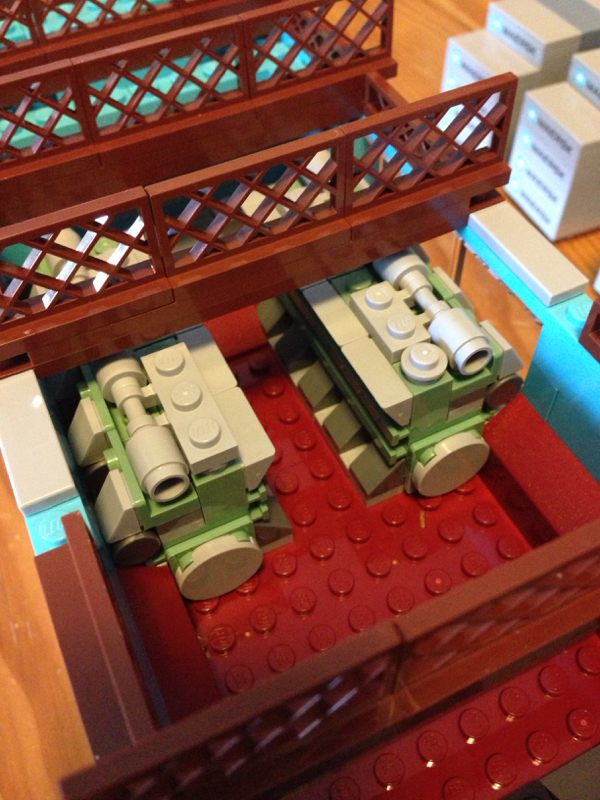 There are loads of parts that are exclusive to this set, including a stack of 1×6 brick with reverse bow, 12×10 sterns (all in medium azur) a wide range of parts in the new dark red, sand blue and sand green colours, and loads of 1x4x2 and 1x4x1 fences in reddish brown. There are also a few parts I simply didn’t expect to find, including a pair of minifigure skates, and a pair of transparent mini mugs. I’ll let you figure out what they are used for (hint: check the images). This set has the most stickers I’ve ever seen in a build. With 115 stickers, it’s a huge pain to get them on. 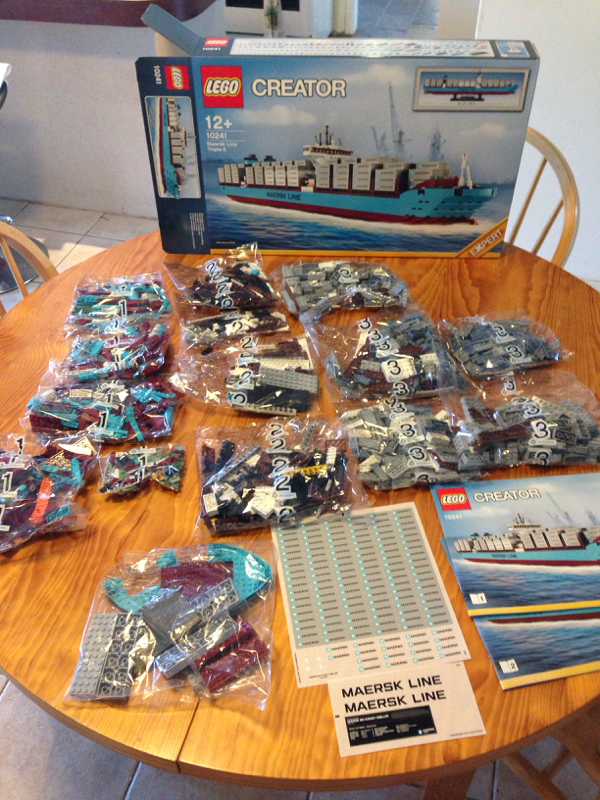 The majority of them are for the containers, and unfortunately many of them are applied on multiple parts, so in order to take this set apart, you’ll have to either sacrifice the stickers, or leave the parts together. It’s a real shame. If you do want to buy this set, it might be worthwhile buying an extra sheet of stickers from LEGO’s customer service department, or BrickLink. The build for this set was great, but at times was a little frustrating. The rudders and propellers are attached before most of the hull is complete, and unfortunately both of these features sit lower than the bottom of the hull. I found when building the hull up after these parts had been attached, that the vessel didn’t sit flat, so it had a tendency to break or bend, or the rudders would fall off. 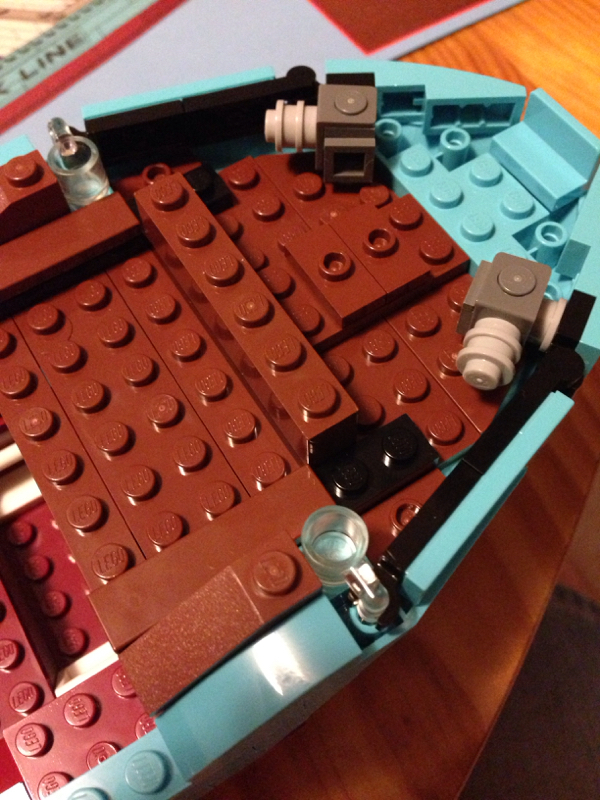 Once the round slide shoes are attached, there is enough clearance for the vessel to sit flat on a table. I’d recommend leaving the rudders and propellers off until last minute. They’re pretty simple to attach, and will make the build slightly less frustrating. Aside from that minor detail, the build is good. Repetitive (especially the containers), but good. 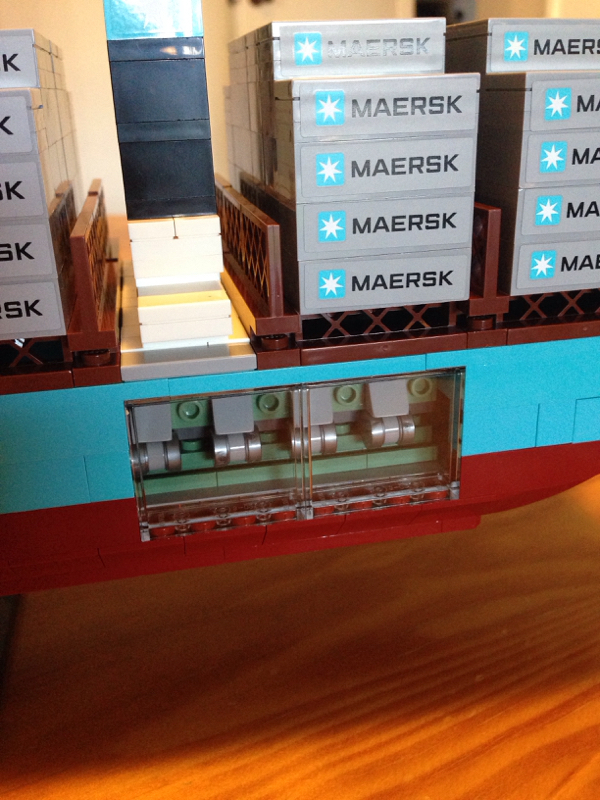 I love the little detail of the coin under the mast at the front, included by Maersk as a sign of good luck. You also get a bunch of spare coins and a gold bullion! The other little details like the way the bridge is built is really nice, and the rescue boats and cranes are a really nice feature. The fact that the engines are visible from both the outside through the windows, and after some container stacks are removed is a really great addition. They look fantastic, and it’s a great item to show friends – it’s a detail they don’t expect to see. All in all, this is a good showpiece. It’s a great size, and has lots of really nice details. With rare colours and loads of special pieces, it’s a must for any collection. The stickers are a shame, but sometimes we have to live with stickers – after all, it’s worth it once they’re applied! This one gets 7.5 containers out of 10. The next review is 21113: The Cave from the new Minecraft theme!